Sellsy allows you to use your own domain name to access your site. 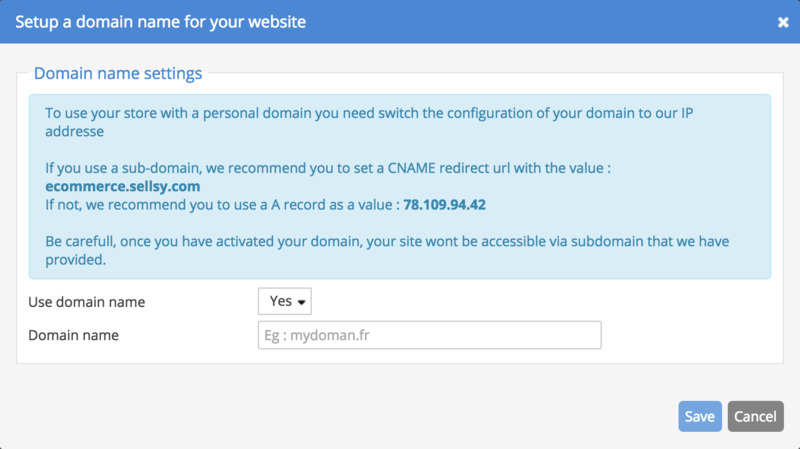 To enable this feature, you must make changes to the DNS records of your website. If you do not manage the hosting for your website, ask the website administrator, or your provider. If you have any questions, please contact us. You must create a website via Sellsy, before you realize your DNS score. DNS is the system for linking a website address (URL) to the IP address of the servers for a given service. All domain names using DNS. Note: it is possible that your provider offers graphical tools to manage your DNS. If you would like more information about DNS, click here. Important: In some cases, manipulating of DNS may require technical knowledge. Make sure you do not mess with other records. Once your DNS changes are made, report your URL in your Sellsy store. From the dashboard of your company, click on Domain Name. As soon as your DNS will be propagated, your visitors will be redirected to your Sellsy website in a completely transparent manner.